Preheat oven to 375 degrees. Place a rack in the center of the oven. Peel the apples. 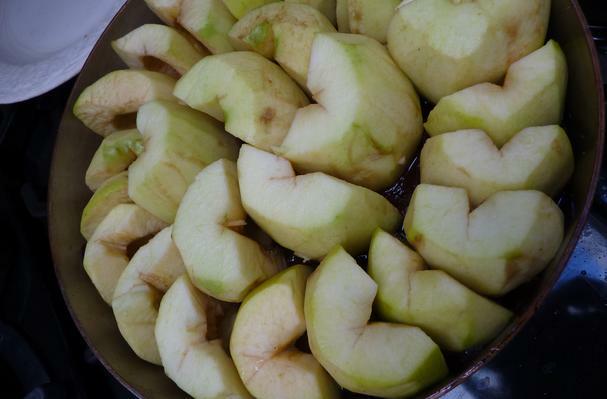 Using a melon baller and a paring knife remove the core of the apples. Trim the ends of the apples so they are flat. In a 9 - 10 inch oven safe pan with straight sides, melt the butter. When the butter is melted, add the sugar and stir it until it is melted and a deep golden brown. The caramel should be smooth and consistent in color. Remove the caramel from the heat and allow to cool for about 5 minutes. On a floured surface roll out the puff pastry dough until it is very thin and larger than the pan. Using the lid of the pan for a guide, cut the pastry into a circle which will fit over the pan. When the caramel has firmed up just a bit, arrange the apples in concentric circles, standing on end into the caramel in concentric circles. Cut a small circle out of the center of the dough (about the size of a dime) and rest it on top of the apples. Any excess dough can be tucked in between the apples and the side of the pan. Place the pan on a baking sheet and into the the oven on the center rack. Allow tarte to bake for about 45 minutes, until the crust is golden brown. Remove pan from oven and place it on a burner over high heat for about 5 minutes to cook off some of the excess moisture (it will still look a little saucy). Place a platter that is slightly larger than the pan and the tart over the lip of the pan. Invert the pan over the platter to release the tarte. Pour the Calvados into the pan and heat it over medium heat, scraping up any bits of apple left in the pan. Spoon the heated Calvados over the tarte and allow it to cool. Allow the tarte to cool for about 45 minutes. When cooled, cut it into wedges and serve it with dollops of creme fraiche.